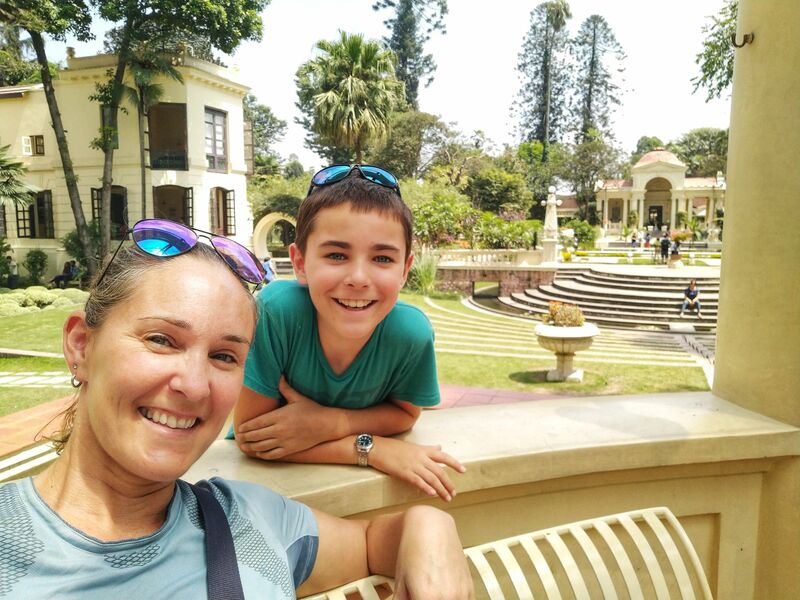 For some reason Family travel in kathmandu always seemed like one of those faraway, untouchable, places. 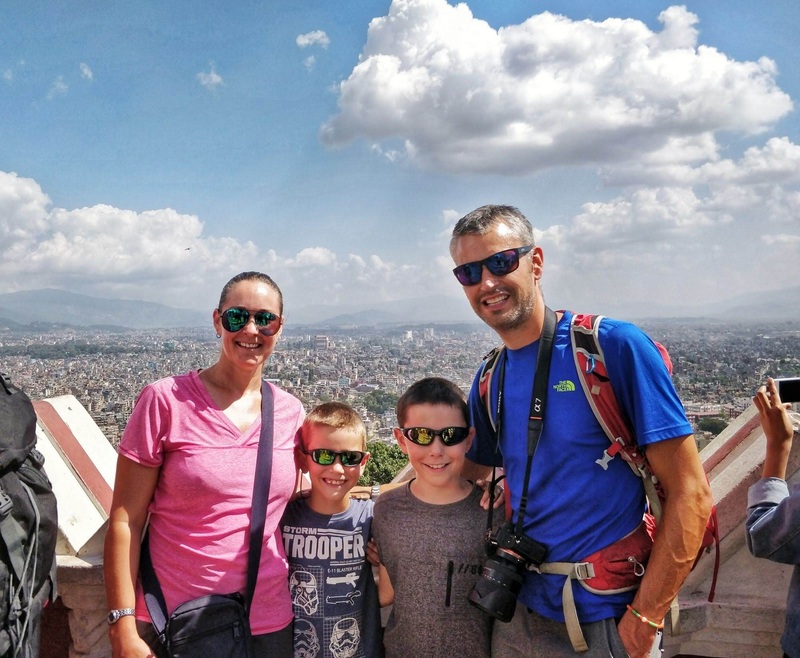 Yet here we were, arriving in Kathmandu with kids!! Yep, got that one wrong. 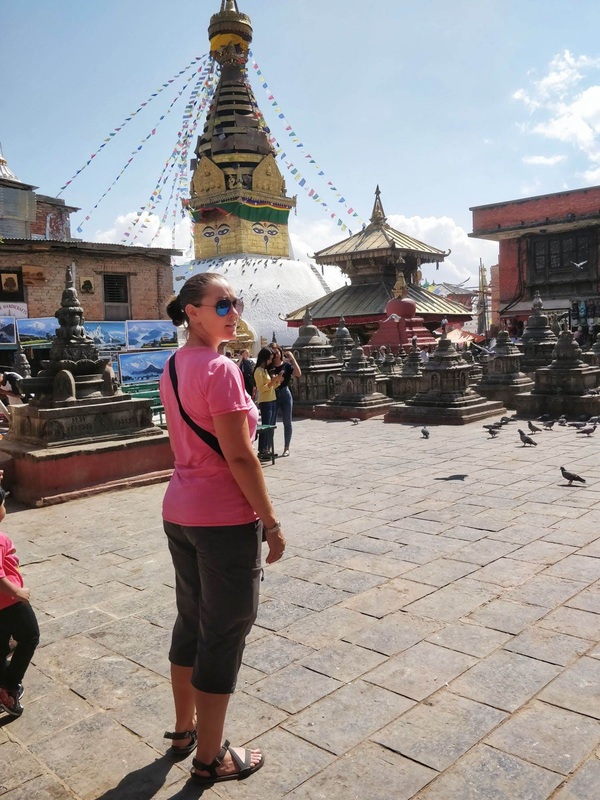 I was definitely not prepared for the craziness of Kathmandu!! 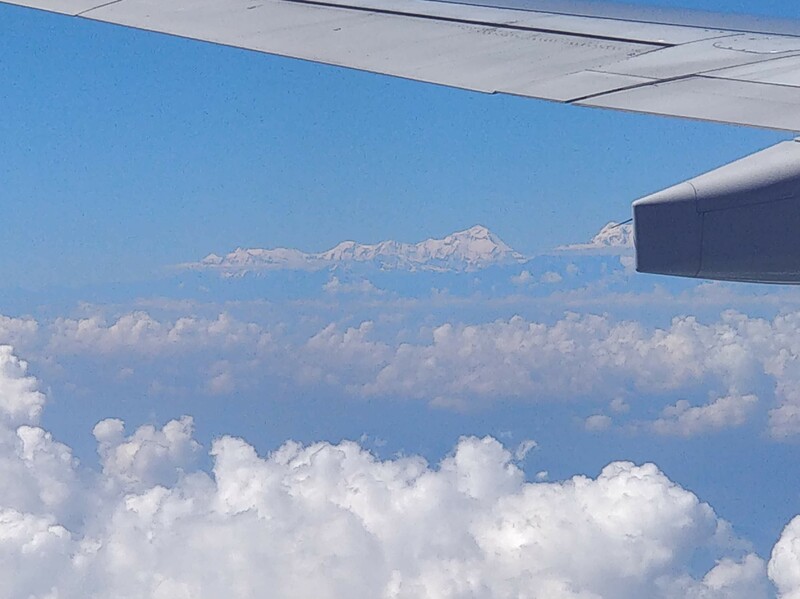 We were mesmerised as we descended the clouds taking in the Himalaya mountains surrounding us. Just wow! The airport is fairly small and basic, but as we didn’t have pre arranged visas the immigration process was quite lengthy. Lots of form filling! 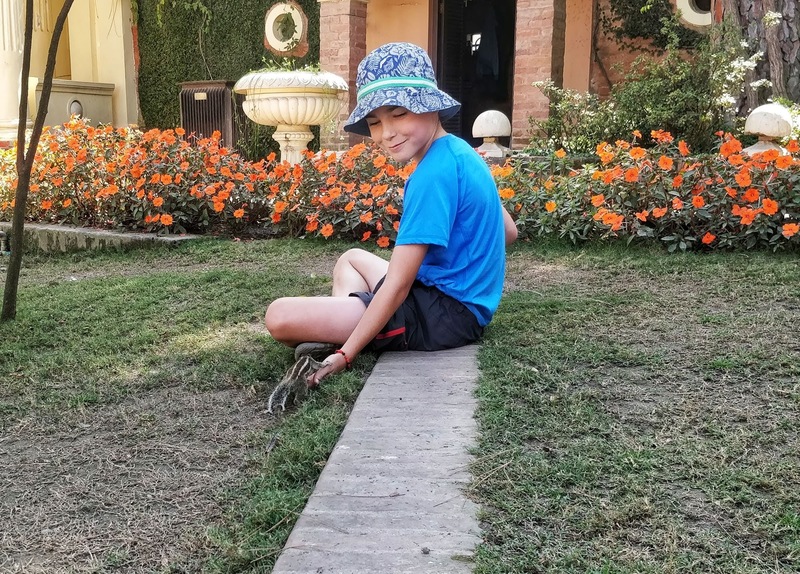 But our added issue was that Ethan was turning 10 while in Nepal. This caused great confusion with the officials as visas are required for 10 year old but Ethan is currently 9! Finally lots of discussions, we agreed just to get Ethan one (something we said we’d do in the first place!!). The joys of bureaucracy! As we stepped out of arrivals, i was surprised that we weren’t accosted by touts, which was a relief! Instead there were several registered taxi options, so we booked one to take us to our hotel. Wow!I I doubt nothing could prepare me for the craziness of Kathmandu. Omg, you can barely move for scooters, bikes, rickshaws, cars, people, dust…And the noise!!! Just wow! The small, narrow streets were jam packed with so many shops, eateries and hotels. The tourist shops selling every trinket, clothing and scarfs you can think of. Outdoor shops selling exactly what you need for a trek in the Himalayas. Cheap and cheerful under armour base layers, north face jackets and bags, walking poles. Anything and everything… but pretty much all fake!! If it’s mega cheap, it’s not real. You can also pick up pashmina scarves – again if it’s cheap, it won’t be real. But they are very pretty!! 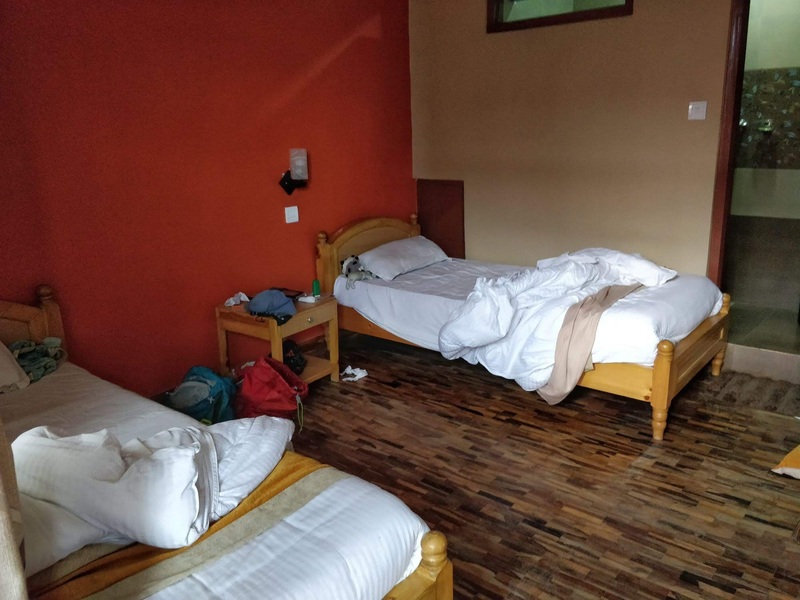 The majority of budget accommodation is based on Thamel. 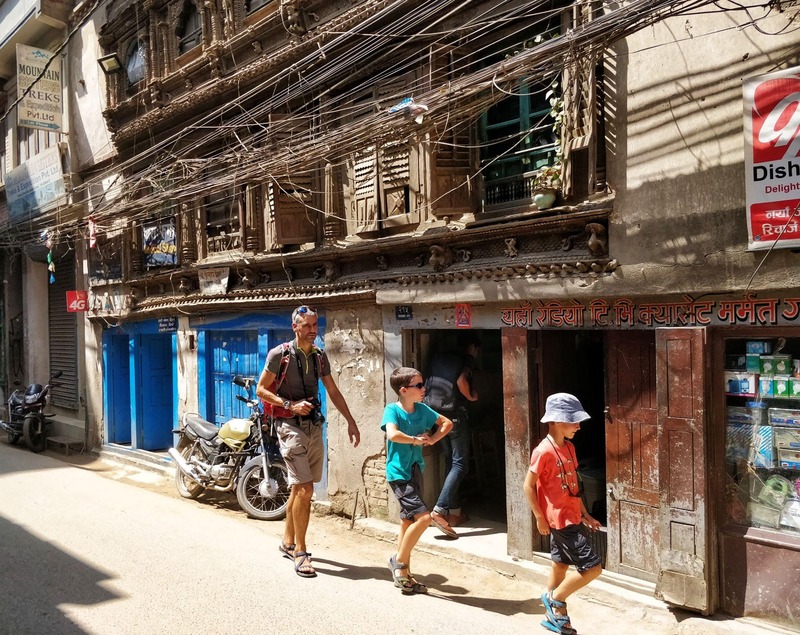 During our first stop, we stayed at Khangsar guesthouse in Thamel. It was based along a side street, away from the busy, dusty and noisy streets. It had a small roof top terrace but no restaurant (yet?!). We had no idea as the staff were not very engaging. It’s great too not be hassled but a little smile and information is friendly?! We ended up with 2 double rooms as no family rooms. It was fine as we were on the 4th floor and secure. 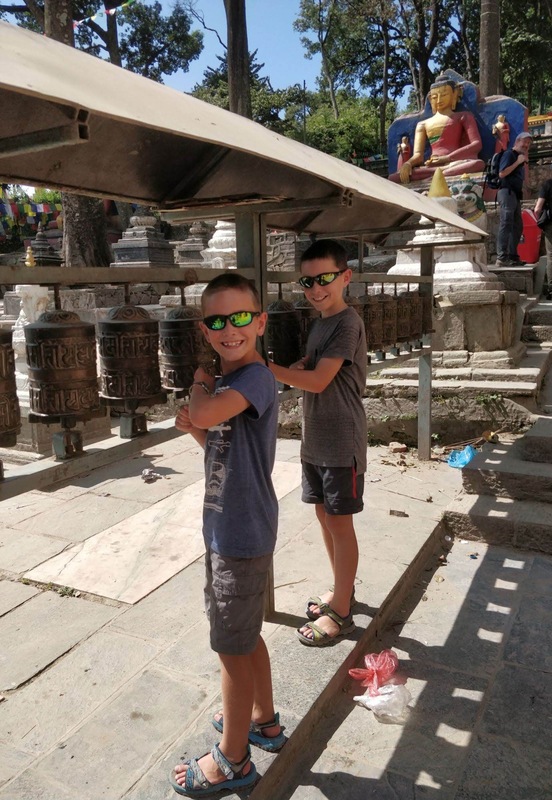 Kathmandu was much hotter than I expected. We needed to ask for a fan as it was so stifling. Once sorted we did have a good night’s sleep. But the peace was lacking ambience and friendliness. On our return journey we stayed at OM Tara guest house. Just some the corner from our last place. It was directly on the road but set back so as to not hear any street noise. The staff were trying very hard to please. I got the impression they may have recently taken over. Everything was helping everyone. We had booked a family room, but were told a group were extending their stay. So again we had 2 double rooms. Not ideal but it’s only for a few nights! The hotel had a rooftop seating area and courtyard dining. But I could never tell if the dining room was open. However, with every conceivable eatery on your doorstep it didn’t really matter! 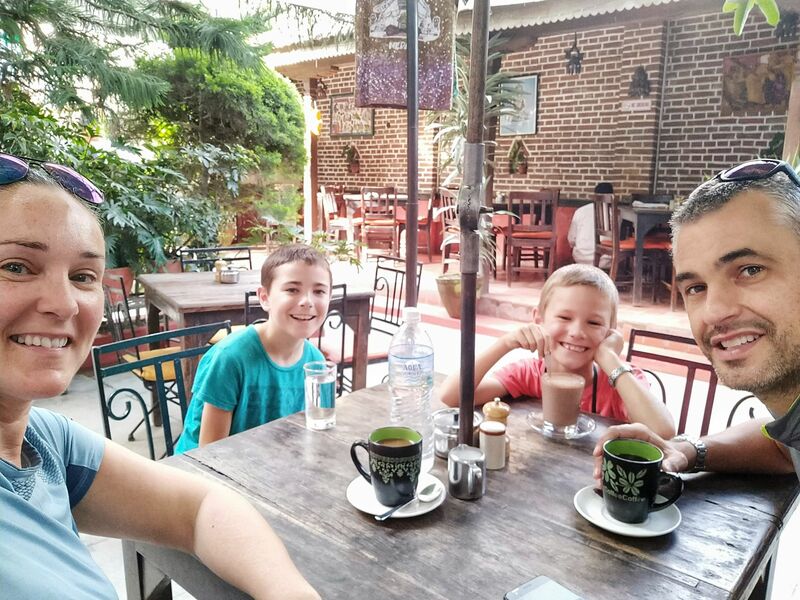 Mitho Cafe – this was our first stop. The cafe looks out of place in the dusty dirty street as it is fairly modern. There are wide open windows and 2 floors with seating. The food had a mixture of international and indian food. All came promptly and the price was not too bad. Roadhouse Cafe – situated in the pedestrian zone we had a ‘treat’ meal here. 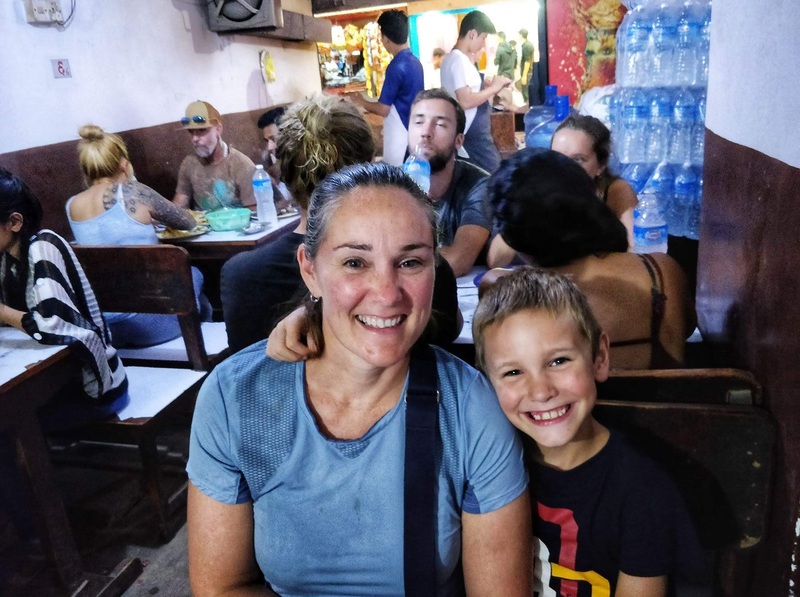 The boys were keen for some international food and so we chose here so they could have some pizza – it was amazing!! but expensive for us. However, as a one off treat it was worth it. Mitra Cafe – we visited here twice for breakfast which had a small courtyard area. The boys loved it as they had an english breakfast with real baked beans!! ha ha. Sometimes its the little things – plus we thought they did pretty decent coffee. Western tandoori & naan house – one rainy night we splogged our way down the streets to find a back street indian restaurant which we’d read about. 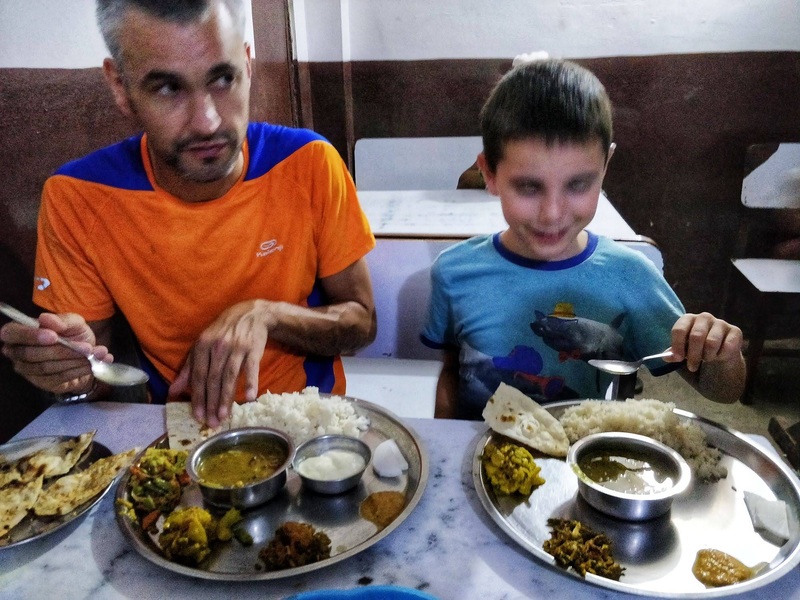 We were looking for a Thali and this place delivered. It was super cheap but the turnover is high so it’s a quick stop, eat and leave kinda place. The food was pretty decent but the first time we visited we had to wait about 10 minutes. It’s very popular, always a sign of a good place. We went back on our return leg! Markham Cafe – we went here for breakfast one day but the food wasn’t as good as Mitra Cafe, the service was very slow and the prices were slightly higher. It was o.k. but I’d prefer Mitra. 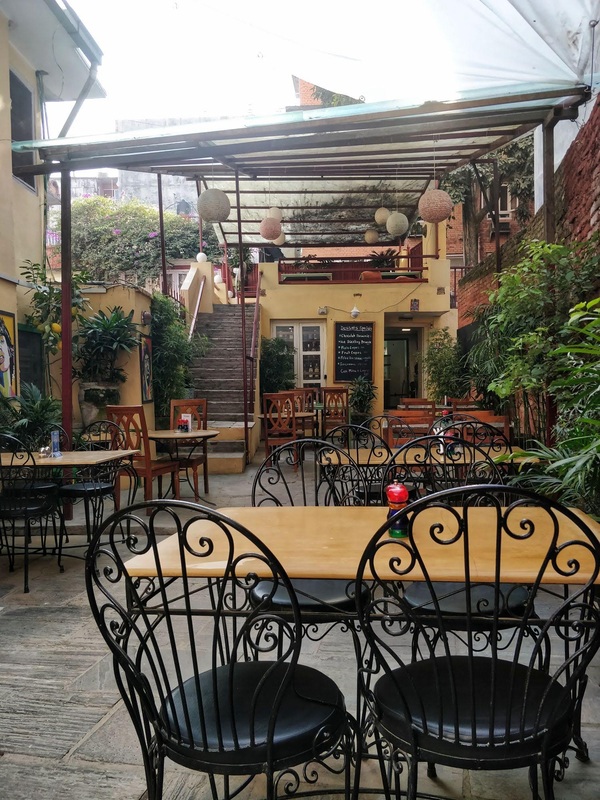 Northfield cafe – we went here on our last night in Kathmandu as another treat night. However, we were very disappointed. We’d seen it mentioned on trip advisor and when we went for a wander around the streets we popped in and saw it was very busy. But mainly with large groups. The food was average and the menu/drinks overpriced. I think I just expected another roadhouse standard and it wasn’t. I’d rate roadhouse cafe over this. Bakeries – more often than not we would visit a bakery for a lunch snack. There is always a selection of savoury items or croissants. We did stop for breakfast at Pumpernickel bakery. Lovely coffee, ok bakery items (cooked menu options too)… but just sooo busy. The staff were nice and friendly, but just overwhelmed with the amount of people. It was very popular! 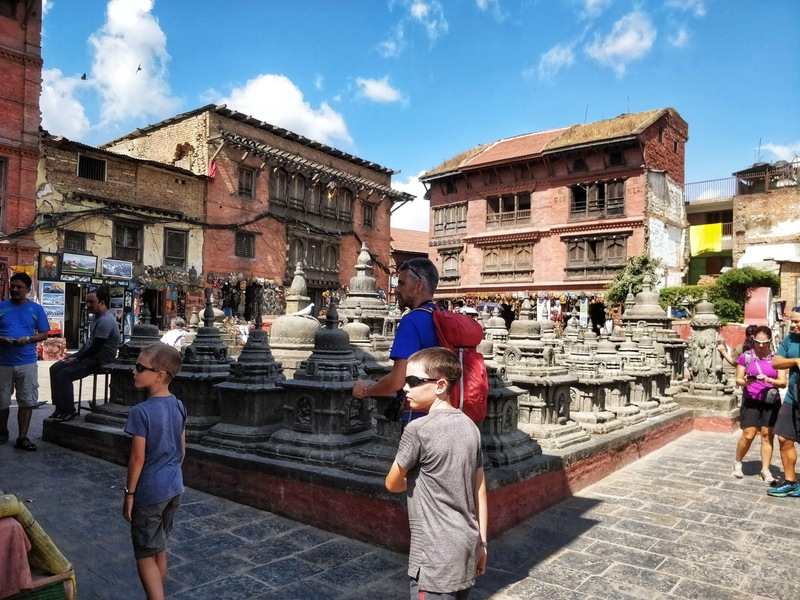 Although Kathmandu is a huge city there isn’t a huge amount on offer for tourists. It tends to just be a stop gap for before and after treks. 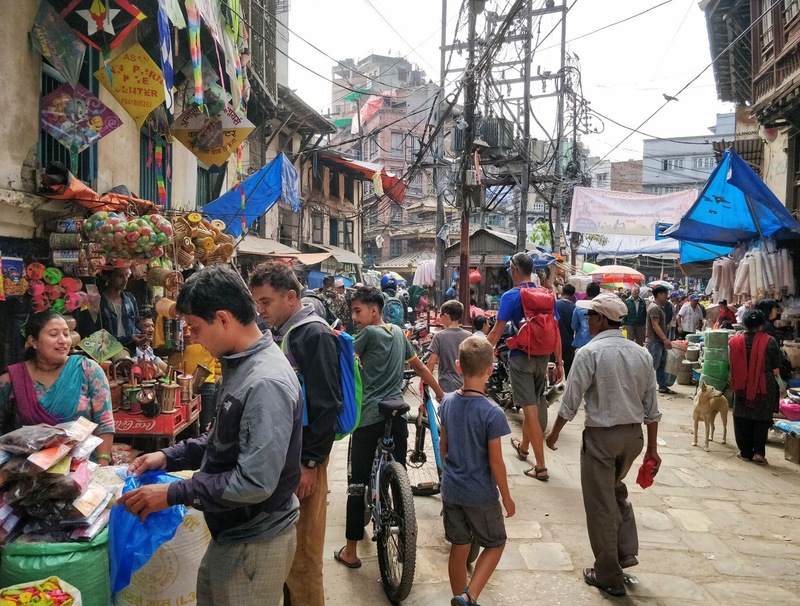 The thamel area has endless shops with travel accessories and travel gear and hundreds of restaurants, too many to name. They all tend to cater to western tastes with very few offering nepalese food (Dal Bhat) as you will eat this to death on your trek! 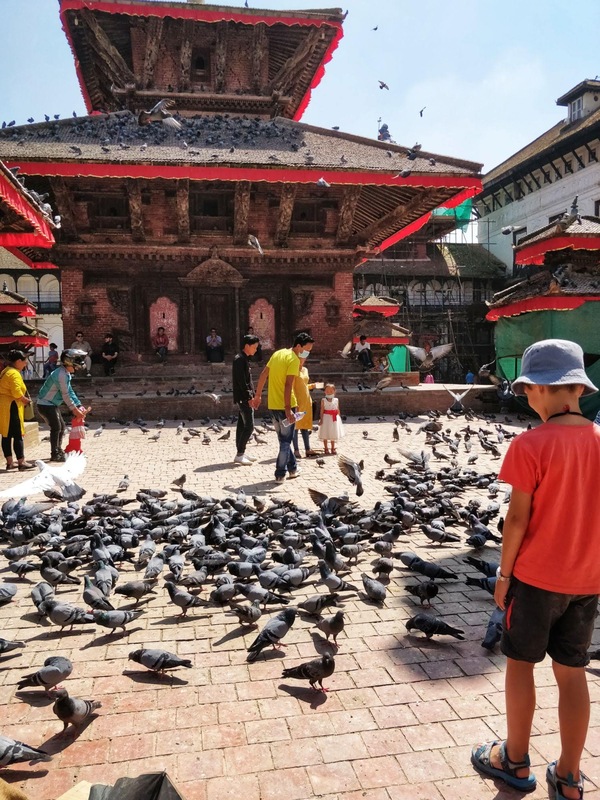 Durbar Square – a wide open square with a number of stalls, temples and monuments. Many of which were damaged or destroyed in the 2015 earthquake. The entrance fee had increased, probably to supplement the re construction work taking place, and is now Rs1000 for foreign tourists. 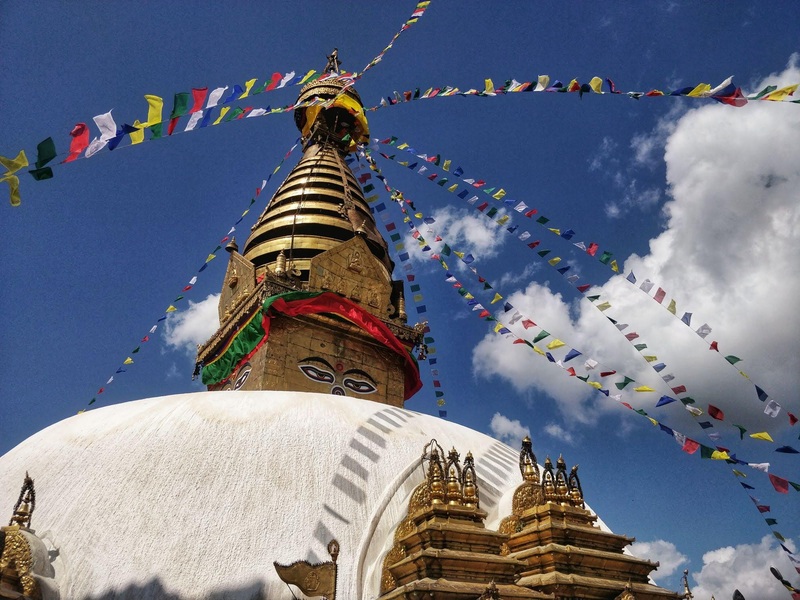 This is a little high for Nepal but it’s still a must see destination. While there we visited a temple where the living child goddess, Kumari lives. They were preparing for a festival in her honour in a couple of days. There are so many festivals in Nepal! As with any tourist site there are plenty of touts selling you their wares. If you sit too long be prepared to be surrounded! 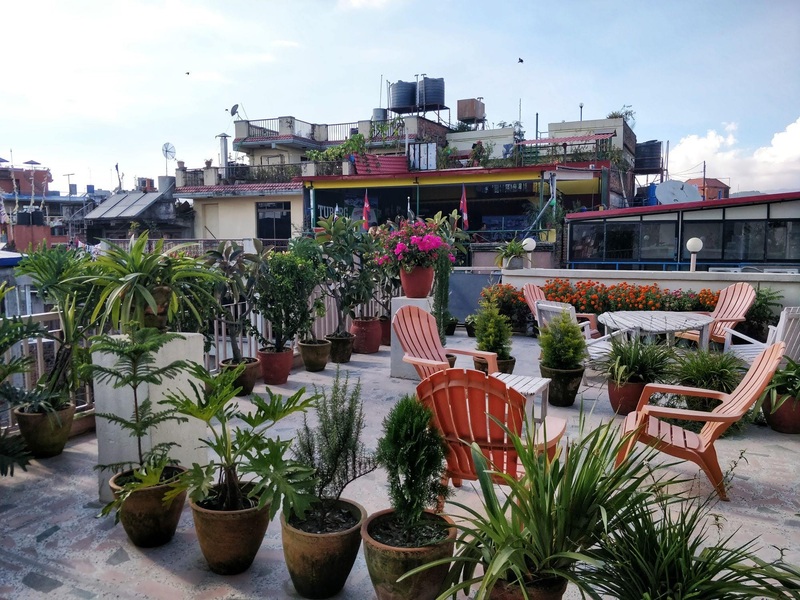 Garden of dreams – which is situated just outside the bustling thamel area and an easy 10 minute walk from our hostel. 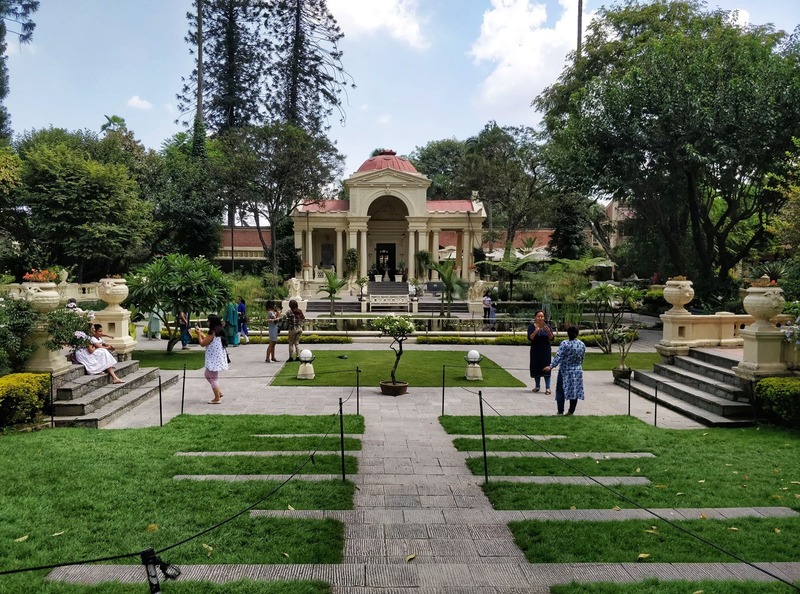 It costs Rs200 to enter (kids half price) and there is a cafe inside, however, you are not allowed to take a picnic (I saw a few people with some smaller snacks and drinks though). 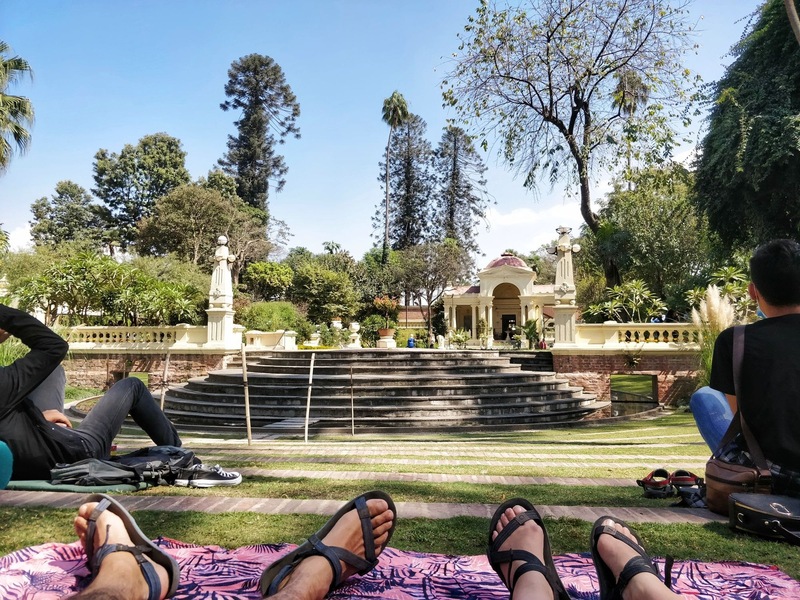 You’ll see a few people reading books and just relaxing around the gardens. 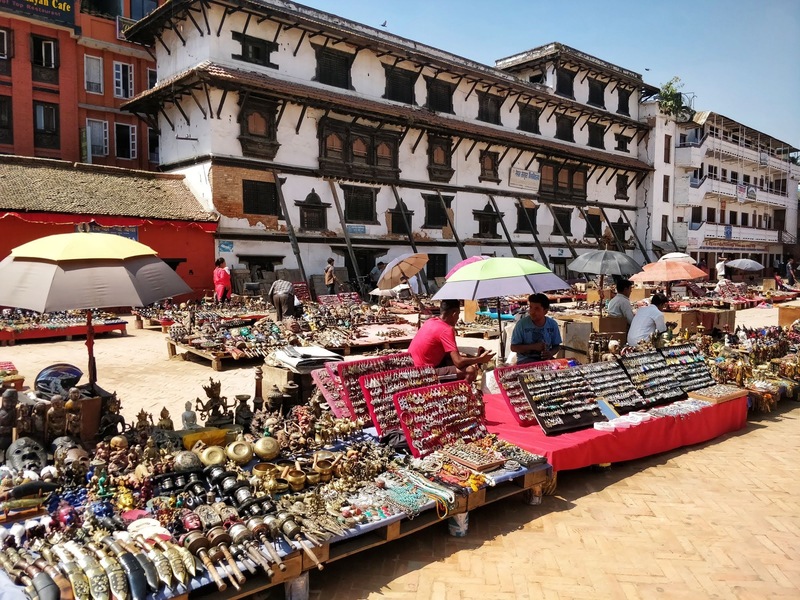 It’s a fabulous escape from the hectic life in Thamel and very peaceful! If you ask the guards you can have a green mat and roll to lie on. While there enjoy the chipmunks which roam around the place and are very friendly – which the boys loved! 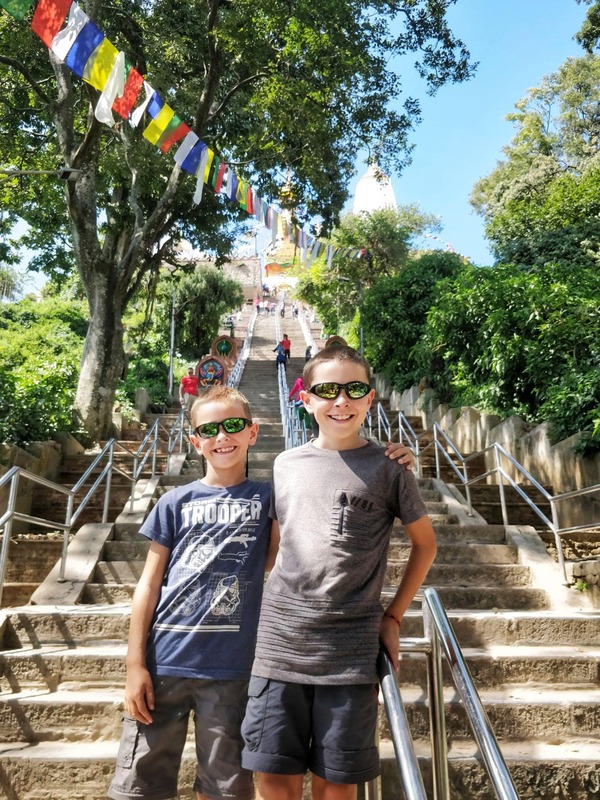 Monkey Temple – otherwise known as Swayambhunath Stupa, is good for a morning or afternoon outing, although if you are there is summer you want to avoid the midday heat. 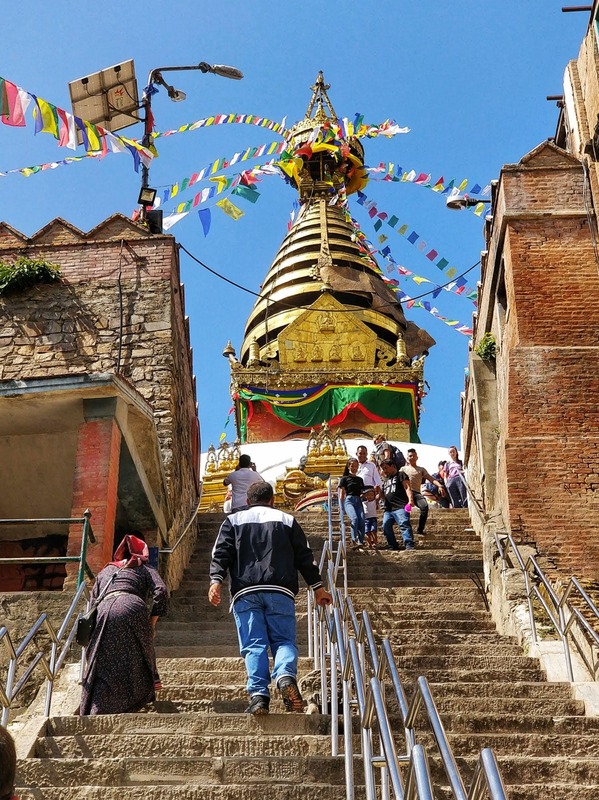 We walked (following google maps) to the temple which was very straight forward from Thamel. It took us around half an hour. When you reach the temple you have to climb up the steep steps to the main entrance. Be warned their are a lot of cheeky monkeys around. You are advised not to have food out and if a monkey comes to you then just give them whatever you had. 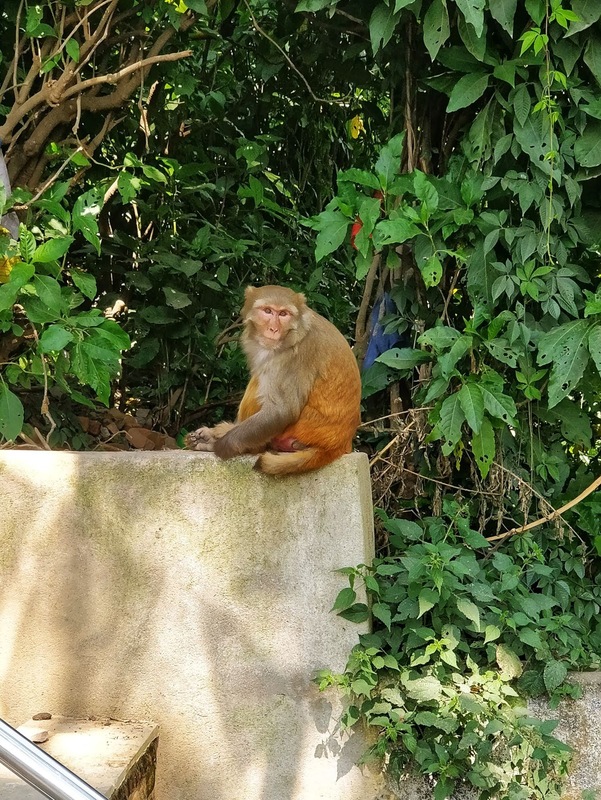 We even saw one monkey grab a bottle of water. So keep them hidden in your backpack. Once we reached the entrance gate, there is a hut to your left where you have to pay Rs200 each for foreign tourists, kids under 10 are free. 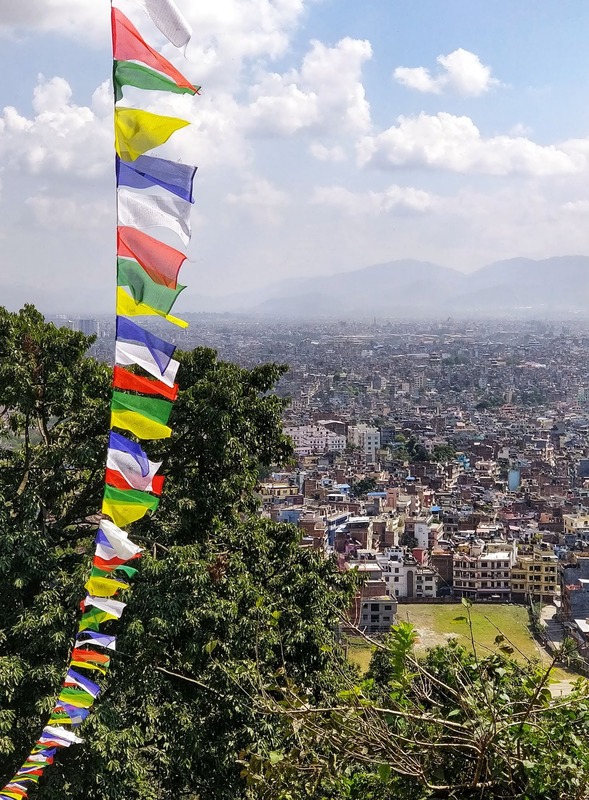 The temple has some amazing views over Kathmandu. The area is fairly small but there are a few cafes and stalls and a number of tourist shops. It’s a nice area to stroll around and take photos. 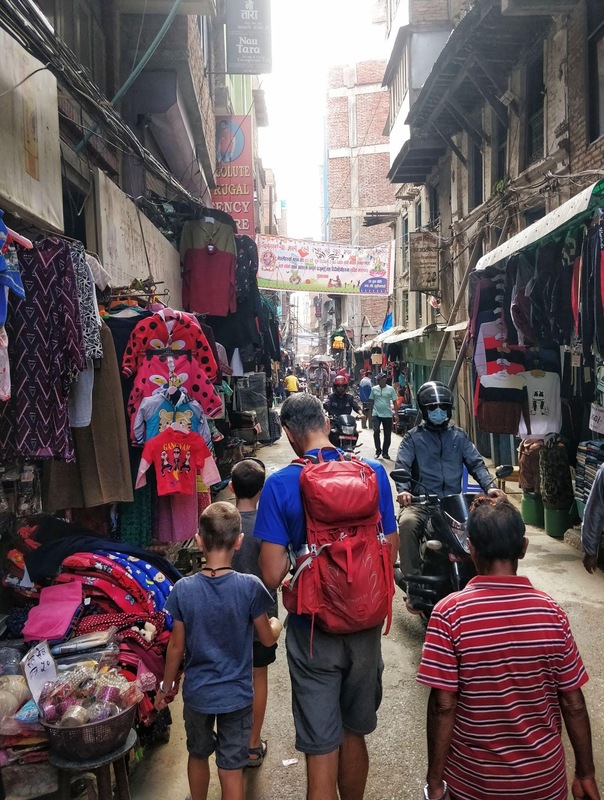 We only stayed around an hour and then headed back down and walked back to Thamel. Kathmandu had now been aptly named crazy KATHMANDU by the boys! 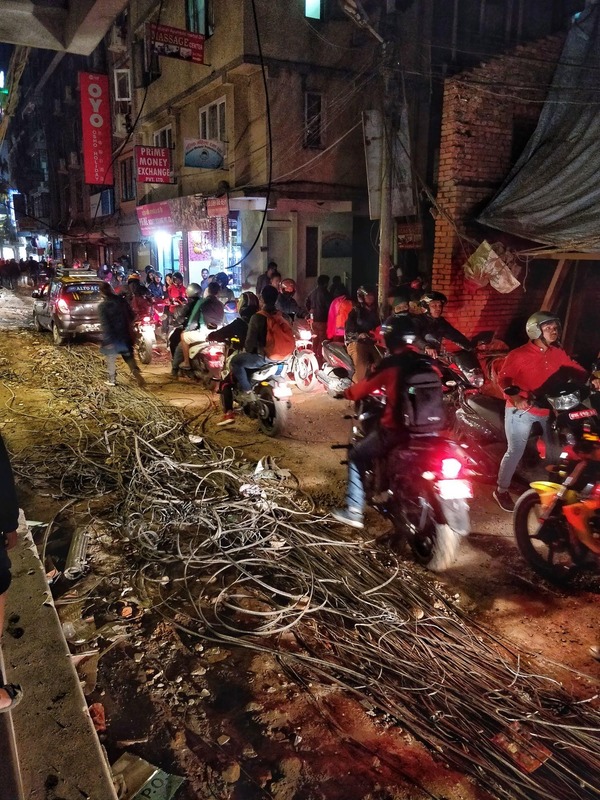 It is a place which is alive, especially in Thamel, with the dirt, dust, scooters, people, cows and generally busy streets. 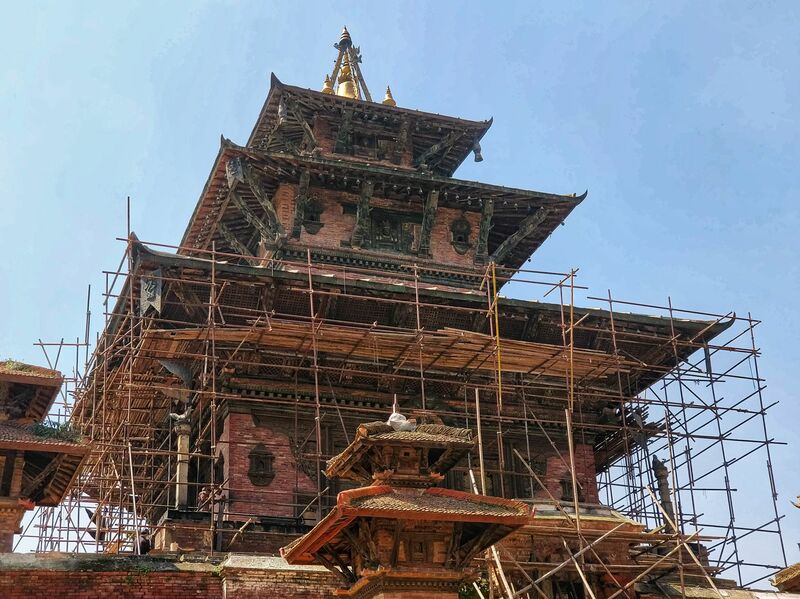 There are a few sites to visit but for the most part it’s about preparing for your adventure elsewhere in Nepal. 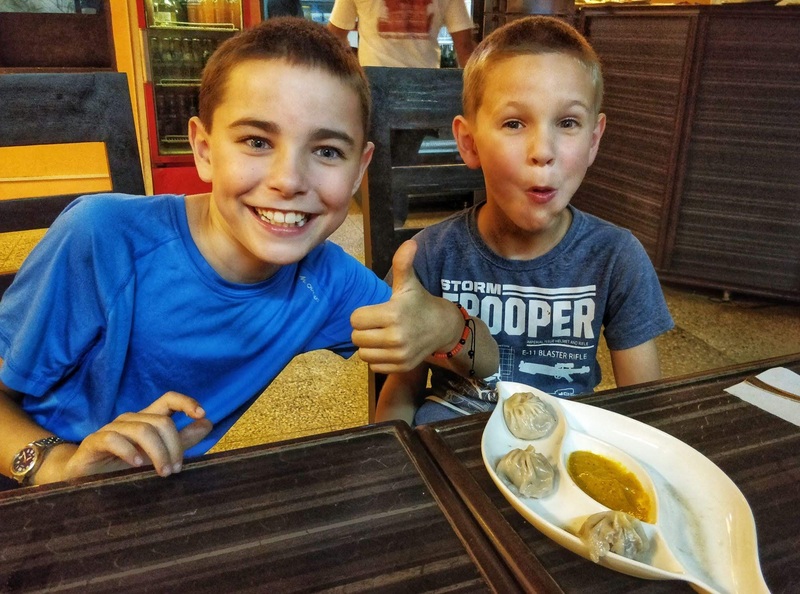 Our favourite pastime was great to wander the streets and enjoy the many eateries kathmandu has to offer. Just sitting and watching the world go by!